What’s in a name? Fortunately for Harriet Bedell, this contest won’t be decided by the number of letters in one’s name. In this category Samuel Isaac Joseph Schereshewsky would not only win 30 to 13 but he’d run the entire Lent Madness table. Two fascinating stories, two amazingly saintly lives, yet only one will move on to the Round of the Saintly Sixteen. In yesterday’s Lent Madness action, despite a late charge by old man Simeon, Phillips Brooks defeated him 52% to 48% and will face Catherine of Siena in the next round. Enjoy today’s penultimate first round match-up and don’t forget to watch the latest edition of Monday Madness. We guarantee it will make your Tuesday even more like a Monday (it’s a Lent thing). 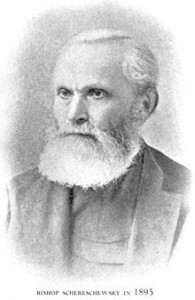 Samuel Isaac Joseph Schereschewsky was born to Jewish parents in Lithuania in 1831, and his early life and studies were designed with the intention that he be ordained to the rabbinate. After studies at the Rabbinical College in Zhitomeer, Russia, he moved to Breslau, Germany for two further years of graduate study. It was there that, under the influence of missionaries, and after his own reading of a Hebrew translation of the New Testament, Schereschewsky became a Christian. In 1854, he emigrated to the United States, settling in Pittsburgh. There he entered the Western Theological Seminary, with plans to seek ordination in the Presbyterian Church. After two years in Pittsburgh, he became an Episcopalian. He enrolled at The General Theological Seminary in New York City as a candidate for Holy Orders from the Diocese of Maryland. He completed his studies there in 1859 and was ordained deacon that year, and priest the next. In response to a great need for missionaries in China, Schereschewsky continued to wander the globe, this time boarding the ship Golden Rule and moving to China in 1859. Already very talented at learning foreign languages, he taught himself Mandarin during his voyage in order to further his missionary work. The time after he landed was extraordinarily productive–by 1865, Schereschewsky had translated the Psalms and the bulk of The Book of Common Prayer into Mandarin Chinese; from 1865 to 1873, he translated the entirety of the Old Testament. In 1875, Channing Moore Williams, who had been the Bishop for Japan and China, was assigned to Japan alone. Schereschewsky was elected as the new Bishop of Shanghai, but he declined, not trusting himself to be fit for the office. In 1877, he was elected again, and this time he accepted and was consecrated. While bishop, he founded Saint John’s University and began yet another Bible translation, this time into Wenli, the local dialect. After developing Parkinson’s disease, he resigned his See in 1883. He remained dedicated to his translation work, even after becoming almost fully paralyzed, and typed the last 2,000 pages with the one finger he could still move. He moved to Tokyo in 1897, where he died in 1906. O God, in your providence you called Joseph Schereschewsky from his home in Eastern Europe to the ministry of this Church, and sent him as a missionary to China, upholding him in his inﬁrmity, that he might translate the Holy Scriptures into languages of that land. Lead us, we pray, to commit our lives and talents to you, in the conﬁdence that when you give your servants any work to do, you also supply the strength to do it; through Jesus Christ, our Lord, who lives and reigns with you and the Holy Spirit, one God, for ever and ever. Amen. Born in Buffalo, New York in 1875, Harriet Bedell first trained to be a schoolteacher, but her life’s work was not to be contained in a classroom. When she was thirty years old, she attended a lecture given by a missionary to China. Soon after she attended the Episcopal Training School for Deaconesses in New York City, a one-year program where she learned about religion, teaching, mission, hygiene, and nursing. Her mother balked at an overseas posting, so in 1907 Bedell accepted an assignment to serve as a missionary-teacher among the Southern Tsitsistas/Suhtai (Cheyenne) people at the Whirlwind Mission in Oklahoma. She served in Oklahoma for nine years until the mission closed. She was then called to work with the Gwich’in people in Stevens Village, Alaska. She was finally made a deaconess there in 1922. However, Alaska was not to be her life’s work. In the depths of the Great Depression, funds were scarce to run the boarding school she had helped to found. She returned to New York in 1931 to plead for funds, but the school was closed and she never returned to Alaska. One door was shut, but another would soon open. On a speaking tour in Florida, Bedell visited a Seminole Indian reservation. Appalled by the living conditions, she wasted no time, moving right in to the Blade Cross Mission, where she lived for the next thirty years. She encouraged tribal members to revive many traditional crafts to sell in the mission store. Her friendship with the Seminole people won their respect, and her faithful witness contributed to the improvement in their quality of life. She continued to serve until Hurricane Donna destroyed the mission in 1960. She died in 1969. Holy God, you chose your faithful servant Harriet Bedell to exercise the ministry of deaconess and to be a missionary among indigenous peoples: Fill us with compassion and respect for all people, and empower us for the work of ministry throughout the world; through Jesus Christ our Lord, who lives and reigns with you and the Holy Spirit, one God, for ever and ever. Amen. 143 Comments to "Joseph Schereschewsky vs. Harriet Bedell"
This was very difficult. Both of these people underwent some mind boggling changes for their faith!! Once again, I flipped a coin and voted for Harriet. I agree. I ended up voting for Harriet because of her translation of Psalm 23. I also want to be one with the Great Chickee. Psalm 23 moved me, too. This was a very difficult choice, as several have been this year. Most difficult choice yet…I had to flip a coin too, and came up with the lady, just because! Samuel Isaac Joseph Schereschewsky is an inspiration as well a shining example of service through incredible difficulties. I don’t know whether you caught that last section of the bio above, but the man spent the last years of his life typing Chinese characters with the only finger he could move, one stroke at a time. It was a partnership in some ways…his wife was the person who advanced the paper on the typewriter roller and changed those pages as necessary. She ministered to him during that time. Samuel Isaac Joseph Schereschewsky is worthy of several golden halos for the work he did producing the Bible in Mandarin and, I think, in one other dialect of Chinese.
. . . and good thing he became an Episcopalian rather than a Presbyterian — since the Presbyterians have no calendar for holy people — he would have missed Lent Madness altogether! True, true – which is why this Presbyterian is enjoying Lent Madness so much! And have you ever seen a Chinese typewriter? Years ago a typewriter store on E. 23rd St (near Madison) had one in its window display — it was a marvel of complexity! I was struggling to decide until I read in Bedell’s biography that her ministry “placed value on health, education, and spiritual comfort over religious conversion.” Health, education, and spiritual comfort are all important, however Jesus also sent his disciples out to create new believers. Understood Grace, but by performing the prior you will likely obtain the later. That was my thought also. Doesn’t say it wasn’t important, just that it wasn’t the first thing she did. I’m with Grace. Education, health, and spiritual comfort are important, but salvation through our Lord Jesus Christ is not only important but vital. I do wish she had preached the Gospel more clearly. Perhaps she did, but the bio doesn’t indicate that. My vote is for Schereschewsky. What an indomitable spirit the man had! Thanks to Lent Madness for introducing us to two inspiring evangelists. Is there really a better way to “preach the gospel” than to do Christ’s work? This is another tough one. I voted for Schereschewsky because he is one of the saints depicted in a large stained glass window over the red doors entering into All a Saints, Omaha. So I look at the window every time I enter and leave the church. Thus he has held a place in my heart for years. I admire his story of translating the Bible even though he was paralyzed and could use only one finger! I agree, Laurie. This part of her ministry spoke to me. Hands-on, trying to help people rather than preach at them. Harriet gets my vote. These were both great people. You aren’t making this easy. We sometimes forget the ministries for our own. Befell served the challenged here at home! Extremely difficult to chooses but I went for Joseph Schereschewsky. AAUGH how do I decide this one? Each person a formidable, challenging example of saintly life…self-sacrficing, losing oneself in the Divine. I think the coin toss is the only way today. I voted for Schereschewsky. It took great courage to convert as a son of a religious family. I have a strong feeling that although his biography made his conversion seem facile, there was a lot of inner turmoil. Then to translate the scriptures in Manderin and Wendi while ministering to his flock is no mean feat. Why SEC must you make the pairings so hard! Both Schereschewsky and Bedell are worthy of the Golden Halo!!! But I ended up going with Schereschewsky for his endurance. To translate when one can only move one finger…. That I might have such endurance for the Lord. You think they’re hard choices today? Wait until tomorrow–the brothers Wesley! Another tough one. I had to go with Schereschewsky, one of my favorite saints. His life and witness reminds me that the journey of faith in Christ is often a circuitous path with many unexpected twists and turns but that always and at every point, God has a plan and purpose. WOW – what a mind-blowing match-up! Why do you guys at LM have to have such an evil streak in your choices?!?!? Ah, such is the “madness” during Lent! I don’t feel converting someone to a new faith is the answer, but that by promoting these things you are showing the world what a true christian is rather than telling them what a true christian is. We have to remember that Christ was Jewish until his death, and he didn’t mean to create a new religion but to show people that through their lives and actions they can promote good in the people they find. Christianity happened because of the people following Christ, not because of Christ himself. spiritual. And meeting these needs can be a powerful means of bringing people to Christ. Even if people don’t come to Christ, if we serve them in whatever way we can we have fulfilled the Gospel. But to bring to the whole world the message of salvation in Jesus Christ is something we are all called to do, in whatever way God leads us. Another great Lent Madness matchup. I enjoyed learning about both candidates. I fell in love with Schereschewsky when I was in seminary and my admiration has never lessened. He gets my vote! Wow. Such a hard choice today. Both amazing disciples willing to give their all to the work of caring, of teaching, of loving, of living fully in the love of God. Finally went with Schereschewsky, maybe just because I am more familiar with his story. Love Harriet Bedell and will look to find out more about her life and work. As much as I like S.I.J. Schereschewsky, Harriet is a deaconess. Being a deacon and being from Florida, and having many Seminole friends, Harriet gets my vote. This matchup is very good because both persons should advance. I flipped a coin and voted for Schereschewsky. This was probably my most difficult choice yet. In the end, I made it for more emotional reasons. I, too, worked in mission with Native Americans, and they gave me more than I probably ever gave them. Harriet Bedell was ahead of her time in valuing Native culture. Both candidates were new to me and both inspiring, but she gets my vote. Hecetu welo! Oh, my. I didn’t see the note that St. Sam is the patron of the internet — vs. a Buffalo native! One of my fave places to eat in Buffalo was Bedell’s Candlelight Inn (now demolished, I think)! Yes, this was a tough bracket today. As a sort-of-almost-Chinese interested in Chinese mission history, I couldn’t not choose Schereschewsky 🙂 Although I like Harriet Bedell’s contextualisation of Psalm 23! Small correction, though: “wenli” was not a local dialect but literary Chinese, i.e. the Chinese used by scholars for scholarly texts, and used not just locally but all over China. A vote for Joseph on this feast day of the Annunciation! I have loved Samuel Isaac Joseph Schereschewsky since I first learned his story almost four decades ago! So, he gets my vote! I ended up voting for Helen because I also want to go to the “Land of the Great Chikee” and be reunited with my husband who was so proud of his Native American heritage. Talk about saints! Either is Golden Halo-worthy, but I’m choosing Schereschewsky in honor of my dad, a two finger typist– and also because if he wins, they’ll need to issue an extra large coffee mug to accomodate his name. Go Joe! I voted for Helen, but I really like the idea of an extra large coffee mug!! Maybe Helen could win but the font could be extra large for those of us who are of “an age”. This was very hard, and I almost resorted to Denis meenie minie mo. End the end, the one fingered typing got me, and I voted for Joseph. That actually should be “eenie”, not Denis. Auto correct strikes again. What tipped the balance for me was the remark by one commenter about the “shared ministry” – Joseph’s wife held the paper and moved it for him so he could write those last 2,000 pages with one finger! So I voted for them (and in memory of my own mother and father, who worked together in a similar way). I vote for Schereschewsky in honor of our amazing priest emeritus, Bob, who has battled Parkinson’s for many many years with similar courage and determination. As an attendee of a church that is in a covenant relationship with a Jewish synagogue, I’m uncomfortable with Schereschewsky’s conversion. He certainly did wonderful things, but that made the difference for me. Agreed, this was a very hard choice. I felt a bit wicked in choosing. I didn’t , however, lip a coin. It just didn’t see “fittin'” to do so; so I flipped a wafer instead. Such a pleasure to vote for someone who ministered to indigenous people with such respect. I Loved her translation of Psalm 23. I agree! Her understanding and respect for indigenous people got my vote! And I did love her 23rd psalm. I’m sure I will use that in my ministry. Thanks SEC for including the text of the psalm. The translation got me as well! It was truly a tough one! As one with MANY letters in my birth name I was pre-disposed toward Joseph. (He also shares the name of my father, my grandfathers and an Uncle. (I suspect great-grandfathers, as well.) Guys – you have to make this easier!!! Consequently, I went with Harriet. Very tough choice today. I almost went with a coin flip, but after contemplation decided to go with Schereschewsky because he seems to have cut a wider swath. Since I am from Oklahoma, I almost went with Bedell because of her ties with Oklahoma, but the larger impact of Schereschewsky swayed me. How could I note vote for someone who asks that “… we will always be welcome in the Great Chickee”? And I so agree with those who have spoken about conversion coming about as a result of observing Christian action. It’s the shorter name for me today … go Harriet! Very tough choice, but since I am part Cherokee, I voted for Harriet because of her work with Native Americans. I’m voting for Joseph both because of the broad similarities in our religious journeys and in sympathy for having a surname that is impossible to spell or pronounce. I was all set to vote for S.I.J. Schereshewsky, a longtime favorite of mine, first for his wonderful name, but also for his missionary work and sheer persistence at typing his translation of the Bible with one finger. He should be the patron saint of all seminarians who stay up late many nights typing their papers. But in the end I voted for Harriet for her work with Native Americans and her respect for their traditions. And THIS is why I look forward to Lent Madness ever year! I love reading about two such amazing, inspirational people. I would have never stumbled across their life stories on my own. I voted for Harriet because of her commitment to the indigenous people of this country. It was close though, because I am impressed with Samuel’s persistence in the face of Parkinsons. Tough choices this year! I love Lent Madness because it introduces me to people like Harriet and Samuel. I have no idea how I will vote. I will be meditating on Samuel and Harriet’s witness throughout the day. votes for the deaconess who served in Alaska. Thank you Heather C. for seeing courage and determination and value in a priest who is fighting Parkinson’s. Blessings to you and Fr. Bob. It’s interesting to read of LM decision-making processes. Many hard choices this season are decided by coin toss or a personal connection. Another difficult choice today. I picked Schereschewsky in my bracket – a no-brainer, I thought. He is an inspiration to me on so many levels, and understood the importance of learning the local language so you can preach the Gospel locally. I was all prepared to vote for him – and almost skipped straight to the voting button. But then I decided to read the bios. And ended up voting for Helen. How could I not? There are too many similarities in our lives and work. And she got it – you live the Gospel first. Let God handle the conversion. That was a startling and brave stance for her to take, especially in light of the Christian Church’s often horrendous treatment of Native Americans throughout North America. “You live the Gospel first. Let God handle the conversion.” Amen, Lauren Stanley! (That is, after all, what Jesus did.) And people from every branch of Christianity yes did horrendous things the the indigenous populations, and felt proud of themselves while doing so. She had a level of courage and faith I think it’s difficult for us now to recognise. It’s still a tough choice, because they are both so dauntless and admirable… but I lean towards Ms Bedell. You’re exactly right, Lauren Stanley. Now I’m wondering what happened to the work among the Seminoles after the storm destroyed their mission. Hello, Lauren! It is great to find you here in Lent Madness – I even thought of you as I read these two bios. Each of their lives had elements you too have lived and for which I respect you. I pray your life and service out west continue well. Sandy Winger and I would love to hear more about what’s happening. Do you still issue a newsletter or are you doing a blog? Let us know where and how we can learn more. I am in humble awe of the depth of spirituality of these candidates. Joseph struck a chord with me. He seemed ready willing and able to do God’s calling, even right up to his one fingered typing end. Although Harriet surely did God’s calling too, anywhere she was called. Tough choice. Agreed, but that was just the start of his ministry! I also voted for him as an educator, as a proclaimer of the Gospel, and as one who persevered over ill health and attendant discomfort to do the work he could still do. No disrespect for Harriet, but I just don’t see her in the same league. I voted for Helen, because her approach to ministry to people in cultures not her own by birth was so similar to my training and experience as a chaplain at New York Methodist Hospital in Brooklyn, NY. Love, respect, and serve every one you encounter, and leave judgment and the growth of the seeds you plant to God. They are both deserving of my vote, but being from Florida and remembering Hurricane Donna well, Harriet gets my vote. If the aim of Lent Madness is to educate us about our saints then it succeeded big time with me today, both of our contenders I had never heard of and both already have Golden Halos! But I voted for Harriet, she is the epitome of a Deacon and I do agree with those who say that witness is in one’s actions and example–preaching the gospel is useless if it falls on deaf (and deafened) ears. SIJS was baptized at trinity Church, now Trinity cathedral, in downtown Pittsburgh. While I was still the Dean there, the Living Church had an article with someone else discussing his baptism, in a different Church, in a different state. I wrote the Living Church and the person who submitted the comments to see if we could unravel this but never heard back from anyone. Nevertheless, I had to vote for old Sam just the same. Betsy, I agree. None so deaf as those who can listen, but won’t. Mash mash mash!!!! quail, hence my vote for Joseph. And, in truth, also a fond memory of my favorite seminary professor having to chant his name at the community Eucharist. This was tough. I ended up voting for Harriet . I did not know much about her. The turning point for me was her respect and love for the native people entrusted to her care. I too had a wonderful and challenging experience working in a Native American congregation while in seminary. Their hospitality and love of Christ was truly life changing. Go Harriet! Hear, hear. I agree with Diane. After reading many of the comments I again today went with my “gut”. Translating the Bible with or without a disability is amazing, but for me the turning point was how she helped the Indians in Florida get back respect and allow them to feel good about themselves. Still a tough one either way!! Such agony had to vote for Joseph for the greater impact on the world but inside I’m rooting for Harriet. However, I would also nominate him as the patron saint of texting –That one-finger, auto-corrected, emoticon-laden attempt to communicate in a global community… he shows us the value of perseverance even when all seems lost (and the screen is cracked!) Does Lent Madness also allow us to ‘elect’ patron saints and not just a golden halo? I’m also part Cherokee but I voted for the Bishop who originally did not think he was fit to be one. The conditions under which both heroes worked were so challenging that they should tie in this Lenten Madness. In overtime, however, Harriet Bedell pulled away winning my heart. Jesus tasked us with feeding the hungry, clothing the naked, taking care of the sick, and visiting those in prison. Harriet Bedell preached that gospel with her life. Really tough choice. Translating for a billion Chinese is very compelling but because our church has a dedicated mission to a Navajo community in Sawmill, AZ I went with Harriet. Two great lives, but I am voting for Schereschewsky because of his dedication to bible translation and his humility in turning down a bishopric on the first time of asking. And also for a Chinese friend who became a Christian through the C of E and is now back in China. Will it ever be easy to choose between two saints? Fortunately, God does not perform triage on them. We’re just having fun discerning types of saintliness and maybe learning something about where our own hearts are fixed. I voted for Schereschewsky because a friend of mine who became an Episcopal priest learned Chinese in much the way he did, and because I took my Ph. D. orals in the former home of Henry Clarke Warren, a Pali scholar who suffered from similar infirmities while translating major Buddhist texts. But whims aside, Harriet Bedell’s story is equally compelling. The only thing that could have made this more difficult is if Harriet ended up in China. Wonderful to read the biographies of these fascinating people. But with Sam I’d most like share a brewski. Nice! Solving a quandry with a touch of humor, besides I love Sam’s last name, although it’s a challenge to fit it into the bracket! Hope I have to try. I loved Bedell’s rendering of psalm 23 too, but Scherewesky has been a favorite of mine ever since i first heard of him. I also love learning languages. And conversion is vital, whether it involves changing religions or not! And I still want a “like” button for comments! I voted for SIJS because he is one of only two saints with visible disabilities (unless I am missing someone) in HWHM. Both are completely awesome, but my vote goes to Joseph for the Herculean task of finishing the translation with only one finger. I have great love and admiration for both these people and their amazing strength and vision. Having had personal experience in Alaska with the bravery of deaconesses in remote areas where they were separated from the eucharist for years at a time simply because they were women I have to vote for the Deaconess. They led the way for the church to take seriously the ministry of women. A long time affinity for the great story and connection with the story of the Hebrew people (yeah, Godly Play) – so appreciated Lauren Winner’s “girl meets GOD” on an individual level and the call as community to embrace the people of God . To read and believe……Joseph. I really have to go with Joseph. My father taught at St. John’s University Boys School in Shanghai. My older brother and sister were born in the early 20s on the campus. The buildings are still there and look much the same as in the old pictures. It is now a hospital. My sister visited there maybe 15 years ago and was warmly welcomed. She and her husband were able to see the rooms where the family lived. Now I know about Joseph and his work there. It as quite amazing. Harriet is also well worth voting for because of her work with Native Americans. Harriet was my godmother’s name. This Harriet bloomed where she was planted…right here in the US, even when she was not allowed to go overseas. Great argument for either saintly nominee, but the madness in me goes to Harriet. But Samuel did amazing work in a foreign land and a difficult language, delaying a bishopric and working through disability. So I voted for Samuel because he was the underdog in the voting. As someone has commented, they both have Golden Halos already. WOW! Another tough decision! Both of these folks went through life changing events worth of recognition. However, I can’t get the image of Samuel typing away with one finger, never giving up his mission for the Lord. Therefore he got my vote. Difficult choice, but I went with Schereschewsky in honor of “St. Chad of Blessed Memory” – a curate who once came to our All Saints costume party dressed as Schereschewsky. Sitting here pulling out my hair! Which one? They are both so deserving. I can’t base my decision on relating to one or the other. I have worked in China as do some of my family members; my husband’s family worked with the Navajo and Hopi tribes. Sigh.. I think I’m going for Harriet. “Yeah !” for the deacon(ess) ! This ministry of deacons is truly growing by leaps and bounds and breaking boundaries as we speak….or rather, as I write. Harriet overcame hardships and boundaries designed to curtail, in some cases, her ministries and to wear her down in others. She prevailed and won the respect of all to whom she ministered in the Name of Jesus Christ: the needy, poor, hungry, and lost. Wow, two great people (again!) – these matchups just show how many great people I still have yet to learn about! But as a native Floridian (yes, there exists such a thing), I vote for Bedell. Correction: on Deaconess Bedell, Gwitchin people don’t live in Stevens Village. Gwitchin folk live about 100 miles upriver (River being the Yukon River). Anthropologists call them “Upper Koyukon Athabascan”; and they call themselves “Denyee Hut’anne”. Deaconess Bedell would have known this; and why it’s important. She once canoed UPSTREAM from Stevens Village to Fort Yukon (+200 miles); and THAT’S impressive. Okay, I’ve done the right thing and voted for Joseph, AND, I’m glad Harriet is ahead. I don’t mean this in a derogatory way, but the SEC are a bunch of evil sadists for pairing these two together! I can only imagine how full of love Bishop Schereschewsky must have been to spend years working on his translation. On the other hand, Deaconess Bedell was so so beautiful in her advocacy. Evil sadists, I say!!! As others have said this was a hard choice as is right when deciding between the Saints of God. Harriet ultimately got my vote for two reasons. First I loved that she met Native Americans where they were and did not insist on discarding traditions. Secondly, I live in Tallahassee and you gotta love a Seminole. Have a blessed Feast of the Annunciation. Easy. Schereschewsky’s spiritual journey from Lithuanian rabbinical study to translating the Bible for East Asia could conceivably be the most christocentric and transformational in this year’s crop of saints. And for believers without cultural anxieties, that’s what it’s about. Schereschewsky. PS– The bio for Bedell makes her sound a bit like the sort of humanitarian anti-saint that some prefer to the real thing. But I have elsewhere seen her described with more spiritual substance. A halo for Schereschewsky, but maybe funding for the right screenplay about Bedell. Schereschewsky is mis-spelled Schereshewsky in the title above. Surely only that can account for the misguided vote today. A very difficult choice for me – both saints called to the ends of the earth, in a sense, each bringing such conviction and energy to their ministries. To have translated the Psalms and most of the BCP into Mandarin so that others would be able to read the Word made a huge impression on me, so I gave my vote to Joseph. I connect with Harriet, though, as I have also felt a call to our Native Americans. As is often the case — choice is a quandary. But, I voted for Joseph. My great-aunt was a teacher in the Episcopal school for girls in the Wuhan area of China in the early 20th century. She taught with deaconesses there and it was the joy of her life to offer the girls a way out of being uneducated because of their gender. Some of the most dedicated, most educated people I know are of Chinese ancestry — and for that I thank this bishop. In the end, after wavering back and forth painfully for some time, I went with Harriet, for putting the first emphasis on improving the lives of the people she was serving with better health and education, before being concerned with conversion; and for the fact that, when it did come to conversation, she also put emphasis on preserving their old traditions, and translating the psalm so heart-renderingly beautifully in their own cultural understanding. To me, that shows a great deal of dignity and respect (and thus, love) towards the indiginous peoples she found herself called to serve–which I tend to view as more important in the end than trying to convert people. What better way to spread the Word, than to live it so clearly? Of course, if you asked me in an hour, I would probably be cheering on Schereschewsky. Typing out Biblical translations, on a Mandarin typewriter, with the only finger he could move? I can only hope that someday, with God’s help, I will be able to show even a small amount of the perseverance and determination that would take! I have to go with deaconess Bedell. Our parish was involved with her back at our beginnings (in a tent). Our first rector, Father Rantz, thought the world of her and we have a room named for her. Had to vote for Joseph. Typing 2,000 pages with one finger – now that’s some dedication! I have admired Schereschewsky for so many years I have to vote for him but this is really a toughy because they were both so dedicated and committed to the spread of the reign of God. Unbelievable saints. I grew up in an area where several deaconesses had conducted an amazing ministry in the outlying areas. They had retired by the time I became a teenager but I was blessed to have worked one summer with a couple of them, who continued their ministry even in retirement. That being said, Schereschewsky has one of the most amazing stories of any modern clergy person I’ve ever heard about. In comparision, his travels from Eastern Europe to America to China make St. Paul’s journeys seem like he went out for a couple of Sunday strolls! So Schereschewsky it is. This was by far the hardest vote to decide. The SEC is making this very difficult as each one deserves the Golden Halo. I am glad there is no like button because if we had one, I fear people would simply say “like”, instead of writing comments, and we would lose some of the community spirit that Lent Madness provides, at least for me. The discussion always helps me make a more informed decision before I vote, people are pleasant in their comments – what a rarity these days – and I leave feeling each time feeling more a part of the Church than before. Thank you SEC, your fiendish plan is clearly working. Last year’s winner, Frances Perkins, has not been dead for 50 years — so apparently that is not an important fact. Is the door opening a small crack for Fred Rogers? Can he wedge his foot in and prevent the SEC from slamming it shut? It’s not the SEC, it’s the General Convention of the Episcopal Church (held every 3 years) that approves such matters. The SEC is not going to put someone on the bracket that is not on some church’s approved calendar. Now if the Presbyterians would like to start up a calendar and add him to it, then we’d have a little more leverage with the SEC. Both avid missionaries, devoted converts. As a devoted convert, I was torn. Then there was the edict to go forth and teach the nations. Harriet cared for the nations of Native Americans, a thoroughly denigrated, demeaned and disinherited group. That won my vote. Does anyone know where I can find Harriet’s complete translation of Psalm 23??? One of the most difficult choices yet. But the best part was being introduced to two people whom I’d never met before. And two amazing people they are. This was a very difficult one for me too. I understand the point of view that Christian saints should focus on conversion. Yet I know no more powerful way of doing that than living the example of Christian humility, and what could be more humble than putting aside a primary focus on conversion in order to focus on meeting the most basic needs of this tribe? Have to go with Harriet as I am also a native Buffalonian. Wonder whether Harriet would vote for Anchor Bar or Duffs wings? 🙂 Thanks for your comments Lauren….. I agree that we live the Gospel first and let God handle the rest. SIJS has long been a marvel to me–languages, humility, perseverance, faithfulness, and the soul of a seeker. What an adventure his life was. Deaconess Bedell is very worthy, also an adventurer, and will do well in the next round, too, I’m sure….it’s pretty much all over, I see after voting…but I’m sorry we won’t get to go further with Bp. Schereschewsky. In honor of my friend Margaret Watson and her current work, I voted for Harriet. I am so glad all the historical saints in LM have achieved sainthood! The saints of today were both missionaries to cultures vastly different from their home cultures. Both had considerable facility with languages. Both worked many decades evangelizing for Christ. One a deconess; one a bishop. I vote for Bishop Schereschewsky for his massive work translating the Bible into two other languages. During much of his working life, he was progressively disabled. And yet, he continued. Another difficult choice. I have been a fan of Schereschewsky for years (ever since I learned to pronounce his name) and really appreciate his finishing his translation with one finger. 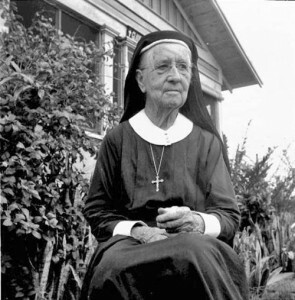 However, as a woman priest, I have to vote for Bedell who could only be a deaconess and did such wonderful work with the Native Americans after she was denied the opportuity to go to China. I voted for Harriet in memory of my friend Johanna Mott – who wrote a history of the Episcopal Training School for women in NYC. Mott, Johanna K., and Frances M. Sydnor. A History of Windham House, 1928-1967. I arrived in NYC Columbia U. in 1965, having left the Southern Baptists behind after seminary & years of ministry for Tenn. Baptists. & Broadman Press. Johanna tried to get me to consider her Episcopal community & the possibility of ordination ahead for women. I went instead to Riverside Church there and now many years of spiritual wandering – including several years spent in a Cistercian monastery – have finally found a spiritual home and community in the Episcopal fold. Well, my conclusion is if its a man and woman against each other, the woman will win. I think they were placed that way intentionally. There has been one exception to this I think. No doubt it was set up this way. That was the toughest one yet – they were both very deserving. In the end I just had to pick one, so Harriet got my vote – mostly because of her work with indigenous people, and not at all for the frock she wore. She looks more like a nun than a deacon(ess) – what’s the difference? What a choice tonight! Schereschewsky has long been one of my favorite “saints” & I love the linguistic prowess he exhibits as well as his willingness to go wherever God leads. However, my heart must go out to Harriet Bedell, much more recently “found” by me, but a woman of utmost courage who bloomed wherever she was planted & died the year I finished college, so I like the immediacy of Ms. Bedell. Difficult but I went with Harriet. The relationship between white Christians and the indigenous peoples of North America has been very fraught, and for good reasons. It’s good to honour someone who spent her time caring about the actual people she knew, above and before trying to get them to say the right words. Go Harriet for being an example of what Christ would do. Though I have to say as a granddaughter of missionaries to China, with a family friend with Parkinson’s, the fella with the long name was tempting. Hi Jane Cox, I will happily wedge my foot in the door with Saint Fred. Try to slam it on a size 12 foot. Wearing steel toe boots yet. I choose BOTH!! What amazing saints … but having spent my teens in Florida and having made some of my dearest lifelong friends there, I will go with Harriet … and be grateful for the introduction to each of these amazing people!